Today, we are so thrilled to reveal to you a remodel project we’ve been working on that has been nothing short of fun! We hit the jackpot with these clients. Not only did they have extremely great taste and they were willing to take really good risks, but, they were also the sweetest, most kind hearted people. This charming little bungalow had great bones to start with, so we really focused on functional layouts and all the little design details that would bring this home to the next level! In order to make the kitchen much more functional, we were able to add square footage to the space by bumping it out towards the back of the house. This allowed us to make room for extra storage, an additional wall oven and much more space for a larger island! 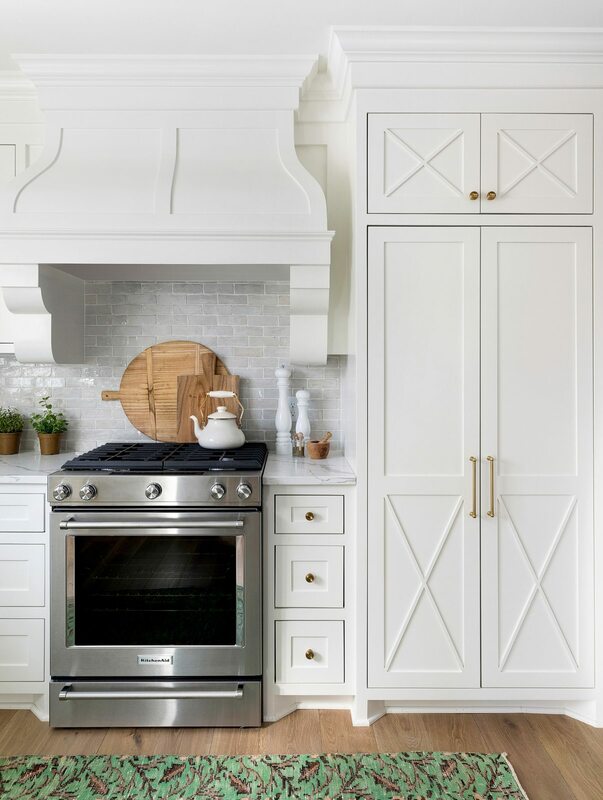 Even though the kitchen still had a small footprint, we made sure to incorporate plenty of pretty details…a pretty curved wood range hood, decorative x-detail pantry doors, oversized brass lanterns and everyone’s favorite, the hand glazed backsplash tile! 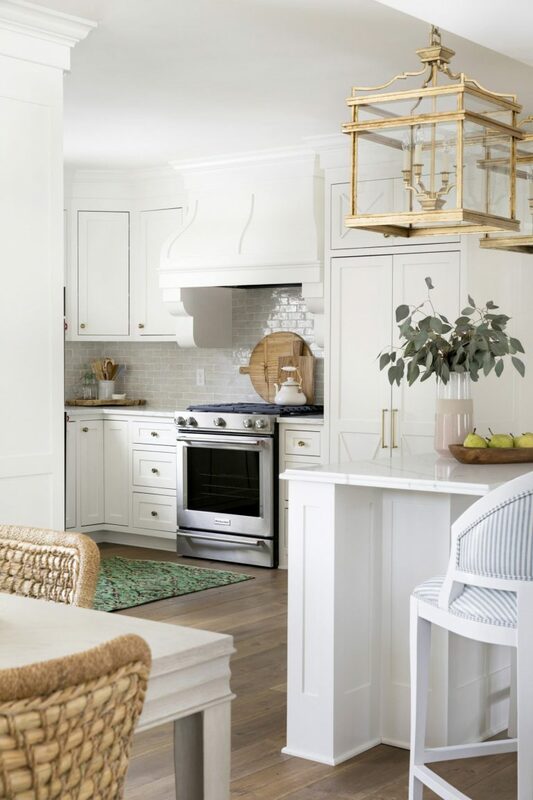 It was important to us to add elements to the home that would make it feel cohesive with the period of the home, the backsplash paired with the aged brass hardware and lighting did just that! It was important to our clients to have a dining space that felt special when entertaining their families. We layered texture in the space through the dramatic lighting and woven dining chairs to embrace a cozy setting that would invite intimate brunches and family dinners. 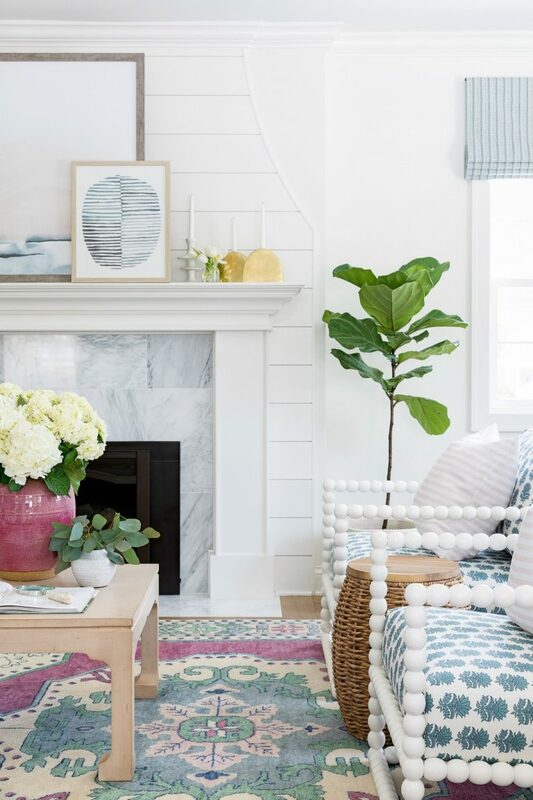 There’s so much to love about the living room! We gave the existing fireplace new life by adding a custom shiplap surround that truly became the focal point of the space. 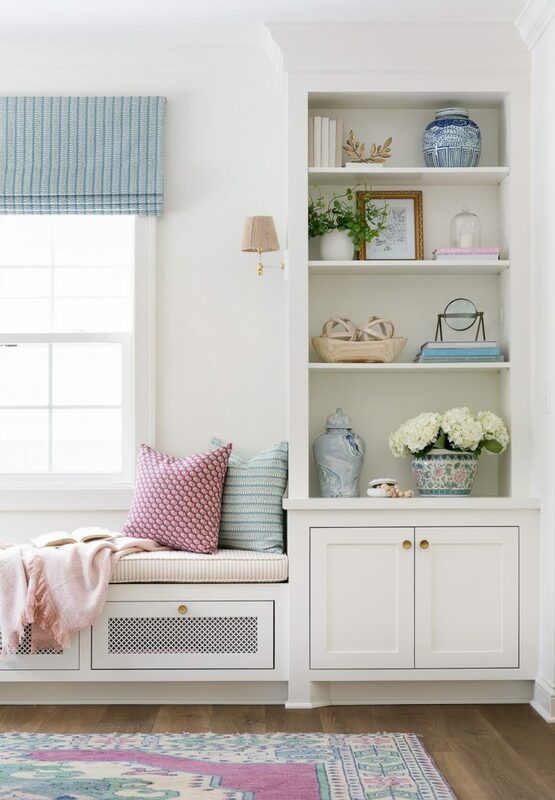 Custom bookcases and a window bench turned out to be the perfect place for our clients to curl up and read a book as well as display their family photos. We kept the walls and built-ins white and infused color through the window treatments, rug and accessories. Luckily for us, our clients loved color as much as we do! The rug was the starting point for us, and the rest of the room unfolded from there! 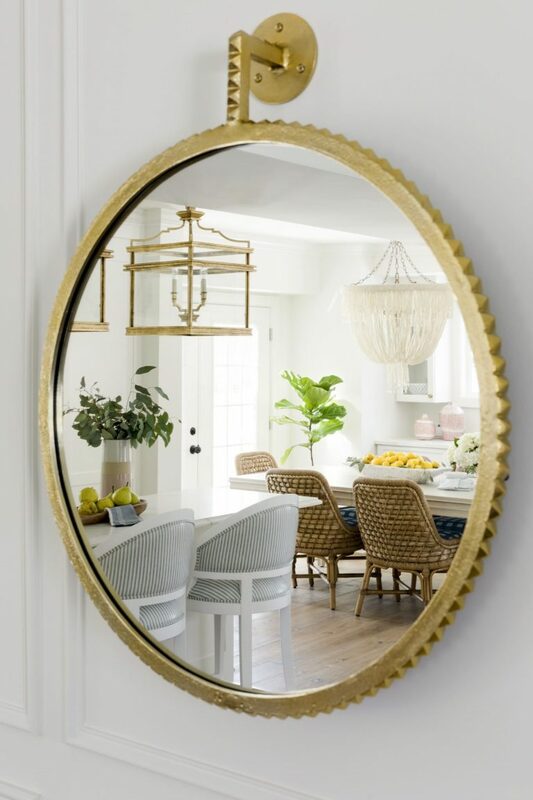 We continued adding touches of brass in this space with the sconces, cabinet hardware and decorative mirror that’s displayed on the custom wall paneling. 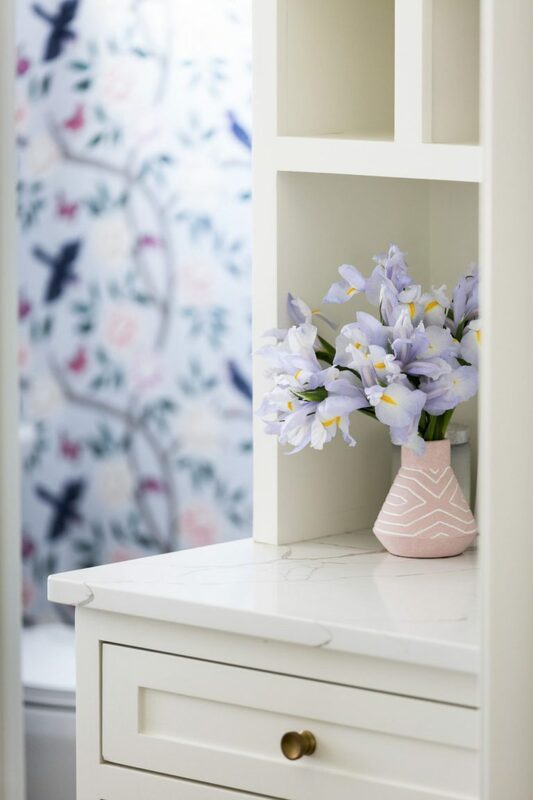 The mudroom and powder bathroom make the perfect pair. The layout of these rooms changed during the remodel….the bathroom got smaller and we made the mudroom larger to maximize the storage. After all, in Minnesota, the mudroom is one of the most important spaces of your home! 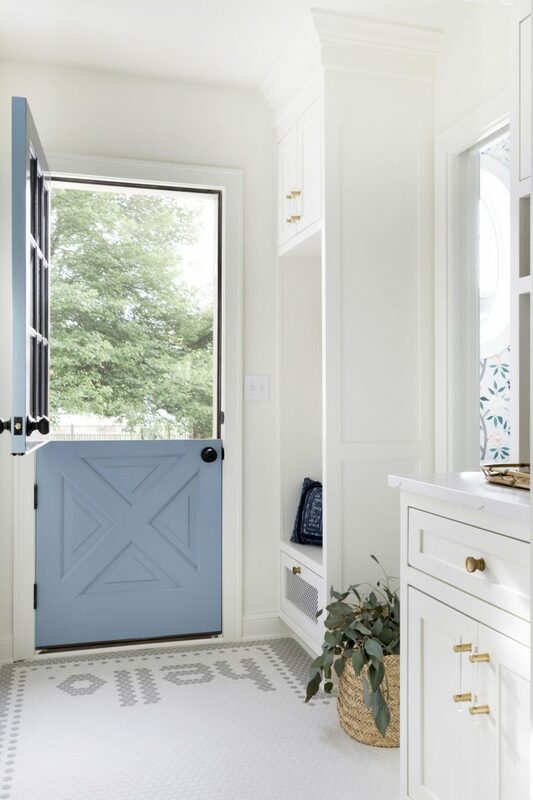 It was one of our clients dreams to have a Dutch door in her home and we thought it would be another great way to bring in a pop of color in their neutral mudroom. 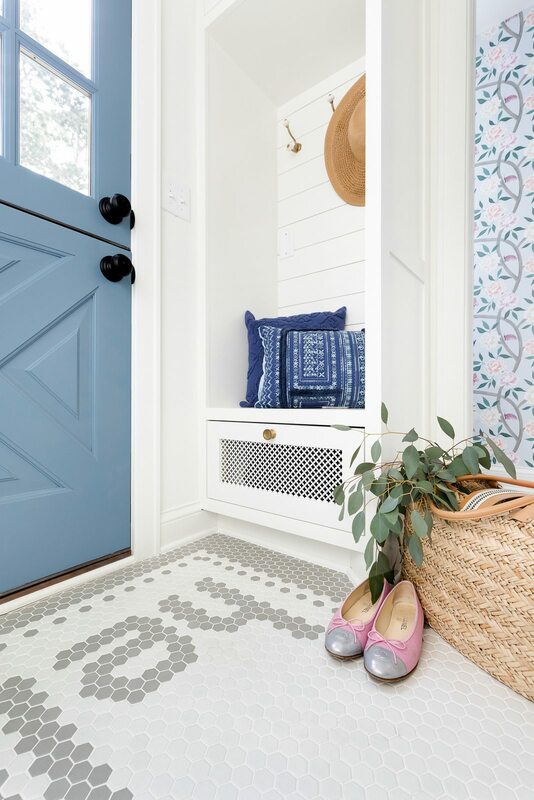 Using white and grey hex mosaic floors was a nod to the classic style of the home, but adding in the custom “hello” script was the perfect way to add some whimsy….it may just be our favorite custom tile installation to date! Even though the bathroom got smaller we made sure it didn’t lack beauty. 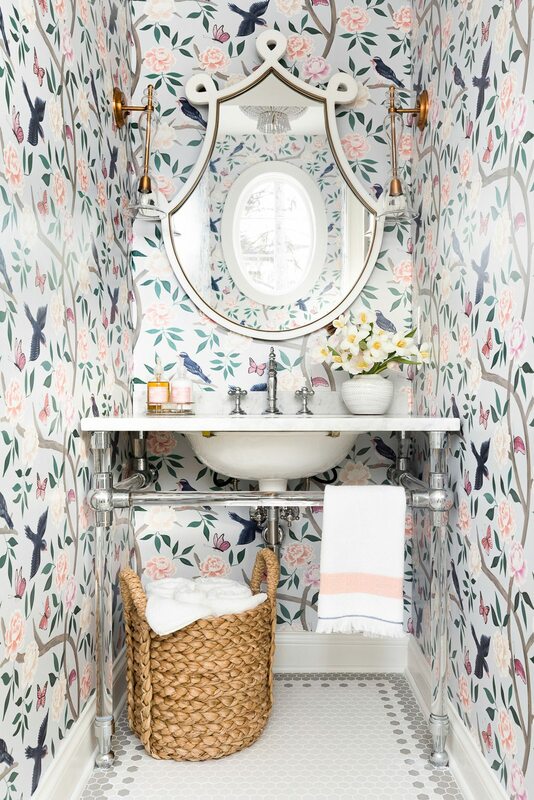 We started by adding a decorative, oval window over the toilet and almost immediately in the construction process knew we had to use this colorful, traditional style chinoiserie wallpaper…we’re so glad we did! 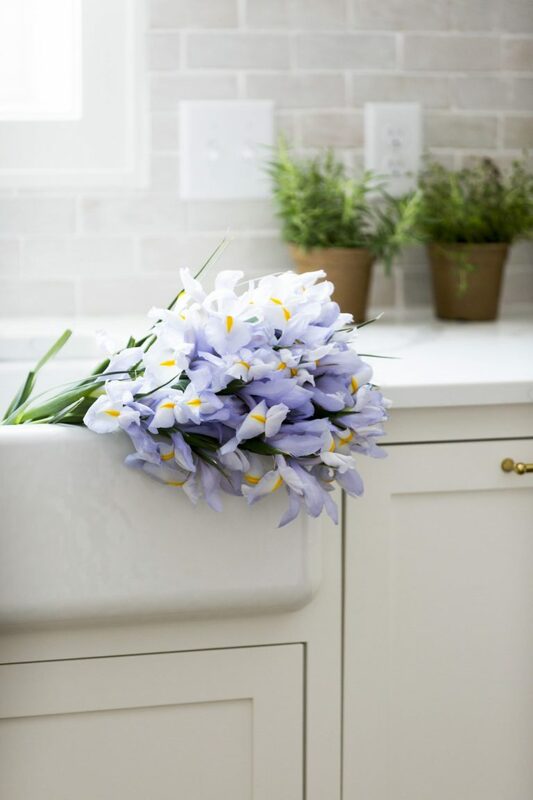 Since we were tight on space, we selected an open, acrylic based console style sink to keep things light and airy. A decorative bone inlay mirror and brass sconces were just what the powder bath needed to feel finished! With a new baby on the way, we wanted this master bedroom to feel like a calming oasis for our clients. Before they know it, these soon to be parents are going to need all the rest they can get! As usual, we paid attention to the scale of the lighting in this room. 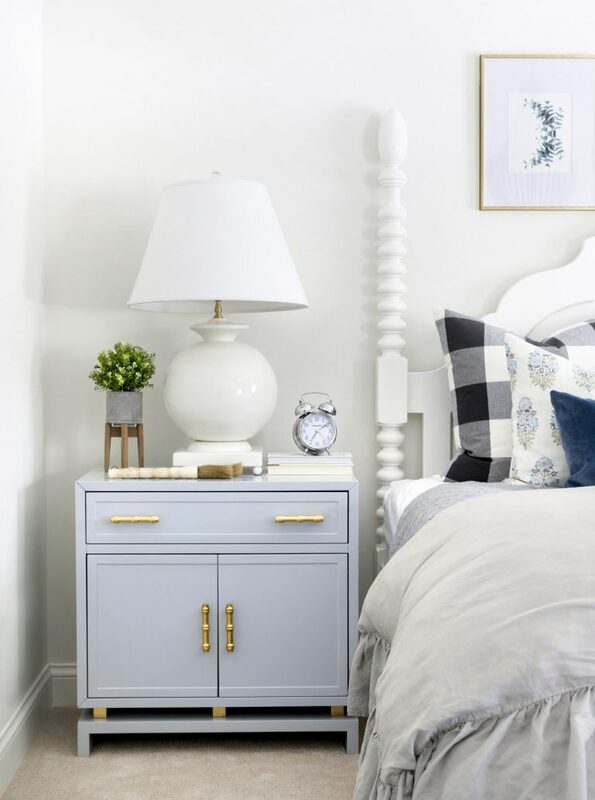 Oversized traditional style lamps and a beaded chandelier, both in a white finish, filled the space while shades of blue incorporated in the window treatments, rug and bedding kept the airy space grounded. We added just the right personal touch by framing love letters written for each other by our clients and custom framed them in brass frames. Another one of our favorite projects comes to an end! We enjoyed working with these clients so much and are so excited to see them grow their family in their new home! Additional Credits: Photography by Spacecrafting. The floors are beautiful. Is it wood, or tile? Hello, I really like how the house remodel turned out! I really like the hardwood floors! What name/stain did you use? I adore the color, uniquiness and brightness in each room! 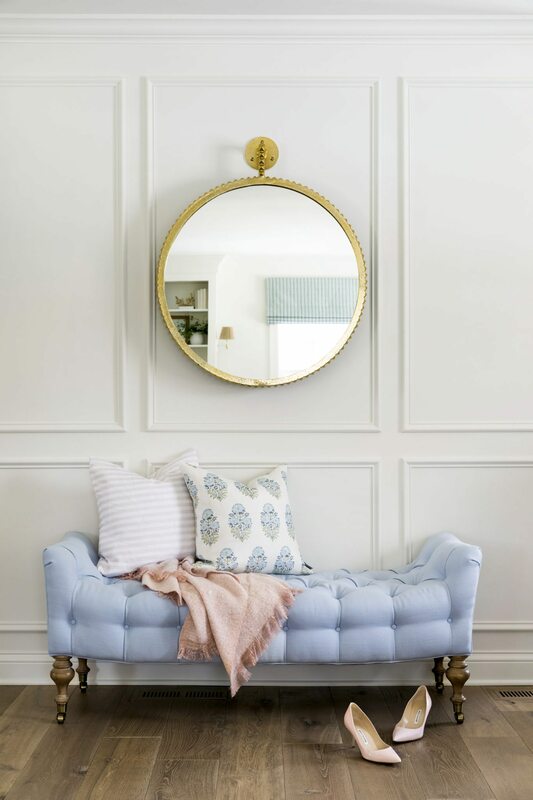 I would love to know where to find beautiful fresh blue drapery panels and roman shades as seen in this project, can you share? The rug is beautiful! Where did you get it? Where can i find the kitchen rug? It is perfect! Where can i get the rug in the kitchen? It is perfect! 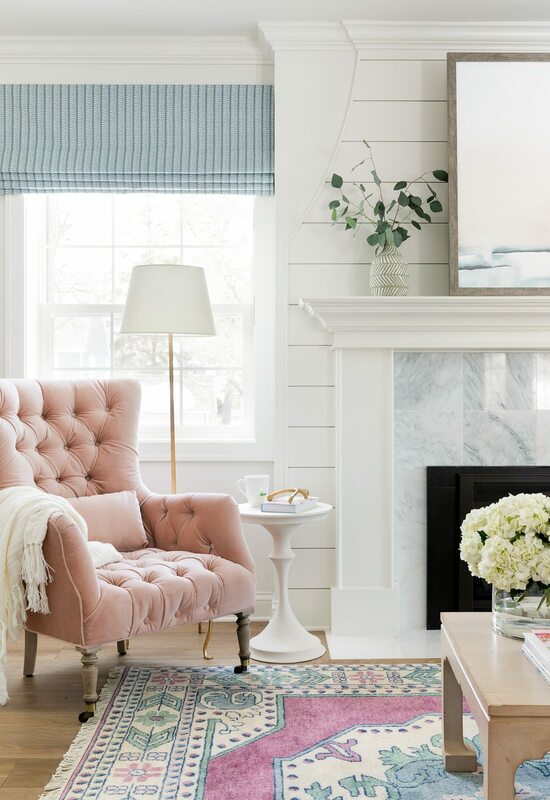 Where can i find a pink tufted velvet chair like the one in this home? This post has me swooning! The colour is so fresh and pretty. I would love any info about those spool chairs… they are perfection! 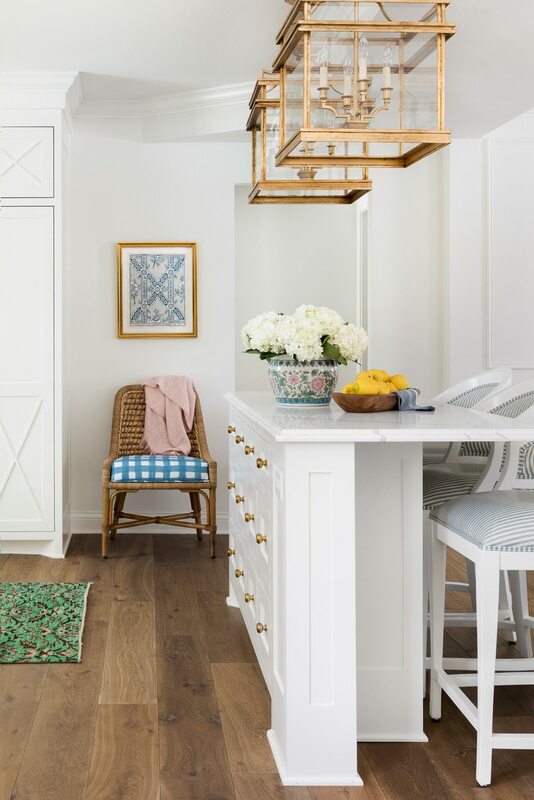 Can you share the source/brand or where I could purchase the kitchen chairs? LOVE THEM! Clarification: I am inquiring about the dining chairs (not the barstools). THANK YOU! You had me at “hello”! All the rooms are so lovely!!! Would you share the source of the pink velvet tufted chair? Thank you! Hi Tonya! The rug is vintage, we loved it too! I would love to know where you got the chandelier in the dining room. It is exactly what I am looking for! Thank you! This is so, so gorgeous. I love the mix of colors, and that bathroom is perfect! This is beautiful! 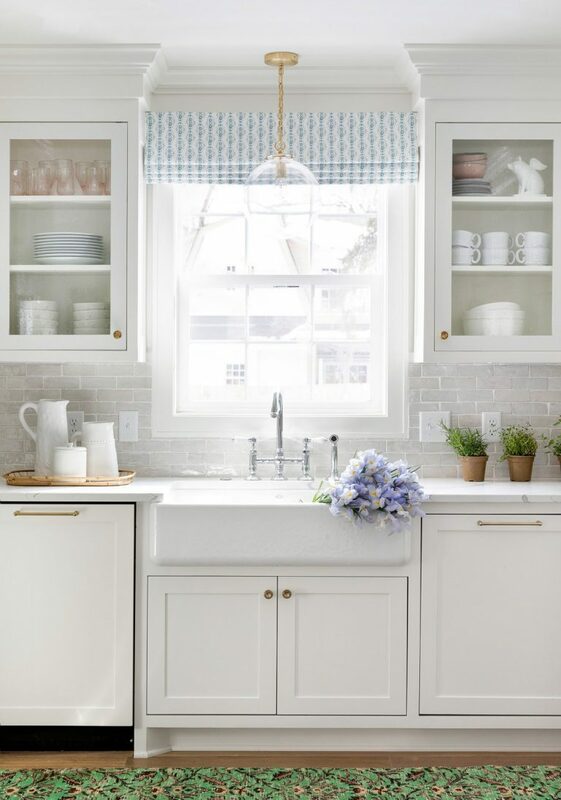 What tile is the back splash in the kitchen? What a sweet and cozy home. Finding myself in a place that is not a home. Trying to make it feel like me. Such a lovely job! I have really loved finding your blog. I am looking at that same tile for our kitchen renovation and agree with your comment about the design going perfectly with brass. Would you mind sharing the grout you all used? I’m a bit worried about that since the tiles are all a little different in width. Thank you Kathy! We will be carrying them in our new Brooke & Lou line! Thank you so much! It was such a fun project for great clients. Hi! The chandelier in the dining room is divine! Where is it from? Lovely! Where did you find the wicker dining chairs? 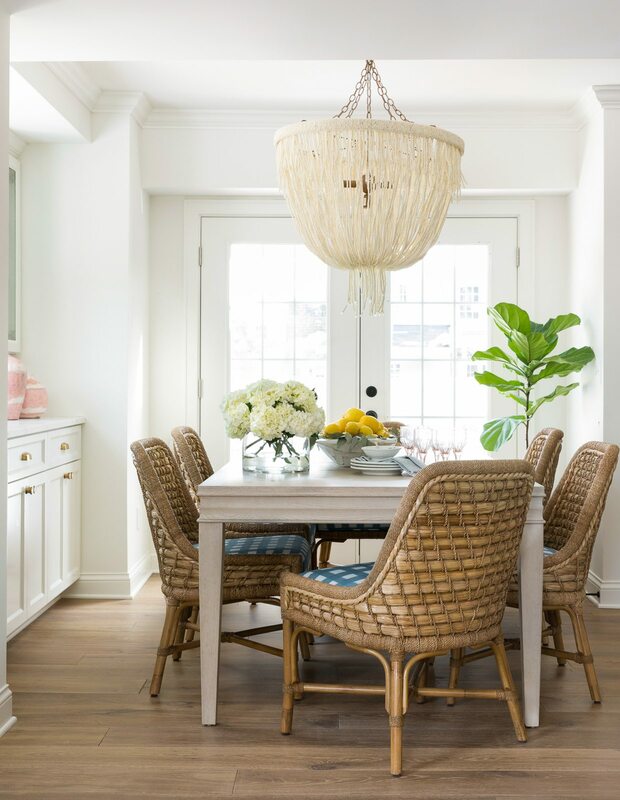 I love the rattan chairs around the kitchen table. Please…. tell me where I can find these. Thank you! Gorgeous! Do you mind sharing the source for the kitchen cabinet hardware? I’ve been looking all over for something subtly brass like that without success. Thank you!